With Alexis Sanchez and his future to worry about, the Mirror has come in with a set of news that might not make a happy reading for Arsenal fans. According to reports from the source, Chelsea appear to be serious with their chase of Chamberlain, and are preparing a £35 million bid for their target. The Gunner only has a single year left on his contract with the club, and has so far shown zero intention of extending it. Aged 23, the player has attracted the interest of Antonio Conte, who believes that the player could fit in perfectly as the right full-back in the Chelsea lineup, and do a brilliant job of it. 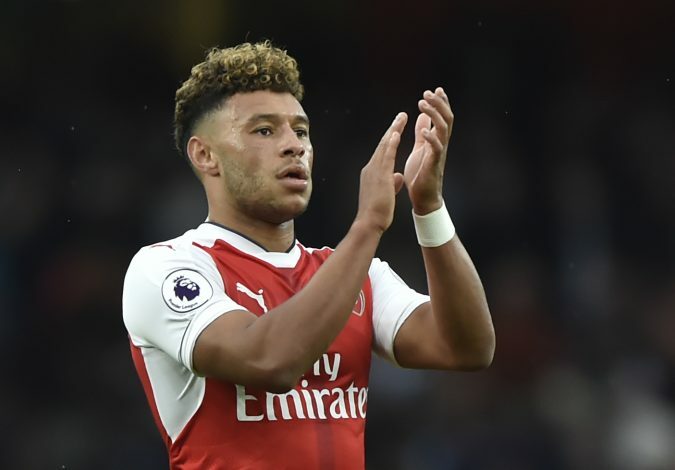 Ox has found it tough to find ample game time under Arsene Wenger, and had been left frustrated by being forced to play on the left flank for majority of last season. Heading to the Champions of England might sound tempting, but he will have competition from the likes of Victor Moses, while playing under a boss who does not rotate squads on a daily basis. The chances of him heading to a fellow London rival do look bright though, with them being placed at 8/10. ‘The Welsh Xavi’ was once a player who rose through the ranks at Swansea before leaving them in 2012, and according to reports coming from BBC, they now want him back. Currently at Stoke City, Joe Allen is being targeted by Paul Clement, who has apparently enquired about the midfielder’s availability this summer. Swansea currently fear losing Gylfi Sigurdsson to Everton, and are desperate to find an able replacement as soon as possible. Allen has grown as a player after spending four years with Liverpool before becoming a major part of Stoke’s squad last season. The midfielder is currently a regular starter under Mark Hughes, and leaving a squad that consistently finishes in the middle of the Premier League table for a team that battles relegation does not sound like a decision he would be too keen on making. While talking about the situation, Stoke’s chief executive Tony Scholes said: “They [Swansea] made an enquiry, they’re a decent club, we told them we’re not interested, that should be the end of the matter. Joe had a great season with us last year and I’m sure he’ll have another great season with us next year.” Thus, the chances of Allen heading back to his former side are no higher than 3/10. According to the news mentioned in Globo Esporte (via Bleacher Report), Jurgen Klopp is all set to chase another attacker during this month, with Luan said to be the intended target. The forward from Brazil has emerged as a priority signing for the Reds after being scouted by the club for a while. The striker scored 11 goals in 22 appearances for Gremio last season – a stat that Liverpool could use next campaign to challenge for the Premier League title, plus have a good run in the UEFA Champions League. The player has been nicknamed “the new Ronaldinho,” and has attracted attention from other clubs like Sampdoria and Spartak Moscow. If the Merseyside club does come looking, heading there without second thoughts is what the forward should do. The possibility of Luna coming to Liverpool is currently 5/10. After having spent two successful seasons with Sevilla, Steven N’Zonzi is all set to leave the club, after apparently handling in a transfer request for the same. In light of such events, the Sun has reported that Arsenal are ready to step up their interest in the midfielder, and will have to pay £36.1m to activate his release clause. The 28-year-old has been scouted by the North London club for a while now, and has plenty of Premier League experience up his sleeves, after his time with Blackburn Rovers and Stoke City. The player scored against Wenger’s men as Sevilla beat Arsenal in a pre-season friendly this summer, and that is another reason for the English club to want him desperately. It might be the perfect opportunity for the player to come back to England’s top flight and prove his worth to those that doubt him. The chances of him coming to Arsenal are currently 7/10.